Keep travelers and travel arrangers informed at all times. Inform and alert travelers of potential risks at the point from the start of the booking process. Quickly and efficiently locate travelers in case of local emergencies. The right tools and information to respond more quickly to a serious crisis. Organizations can identify and rate the level of risk – global, geopolitical, health and environmental – associated with travel to a specific destination on a scale of 1-5, and publish destination-based messages and alerts on the Traveldoo booking site. Travelers and travel arrangers are instantly informed of the risks associated with their trip while they are planning it. Travel approval workflows can be dynamically routed according to risk severity. 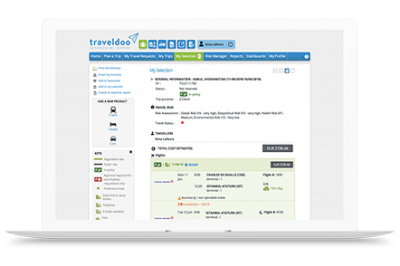 Traveldoo Risk Manager features interactive maps and online reports to help companies identify employees who are traveling to at-risk areas. Program managers get instant access to online traveler tracking reports based on bookings made through a range of channels including on- and offline, GDS and non-GDS. Consolidated travel booking data are overlaid onto Google Maps to make locating travelers’ locations easier. 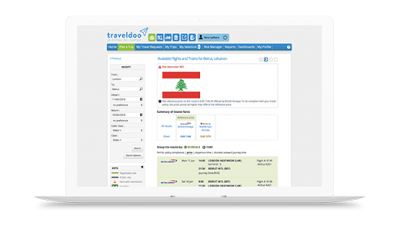 Traveldoo Risk Manager thus lets companies take preventive actions and make real-time communications (e.g. by customized email or sms) in a very simple manner and provide faster assistance to their travellers in the event of an emergency. Better insights into travel spend and expense reports. Increased program performance. 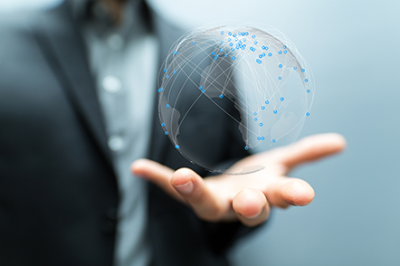 Simplify complex travel plan management, with the integrated assistance of your preferred travel agency. Itinerary management and sharing made easier. On-the-go expense tracking with geolocation, voice and digital receipts.